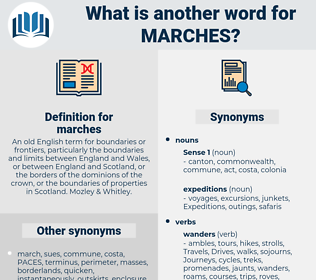 What is another word for marches? An old English term for boundaries or frontiers, particularly the boundaries and limits between England and Wales, or between England and Scotland, or the borders of the dominions of the crown, or the boundaries of properties in Scotland. Mozley & Whitley. Trademarks, markings, markups, flags, Ticks, brands, marks. marchers, marketplaces, observances, celebrations, manifestations, demonstrators, gatherings, courses, performances, motorcades, sit-ins, procurements, protesters, ramifications, closures, protests, Festivals, reservoirs, pronouncements, assertions, occurrences, checkpoints, expressions, fairs, barricades, utterances, roadblocks, blockades, hikes, contests, TREADS, streets, Phenomena, gears, barrages, Outbreaks, contracts, weirs, approaches, shows, displays, walks, events, dykes, FACETS, guises, dams, Paths, booms, venues, passes, brands, Feet, signs, blocks, Rallies, procedures, stairs. estate, inside, region, citadel, center, interior, territory, land. By making rapid marches we reached Crook's camp on Goose Creek about the third of August. The Vizier Horam set out in a few days from Delhi with three hundred thousand troops of the flower of the Sultan's army, and by forced marches reached the confines of Cassimir ere the pretended Sultan Hobaddan had notice of his arrival. 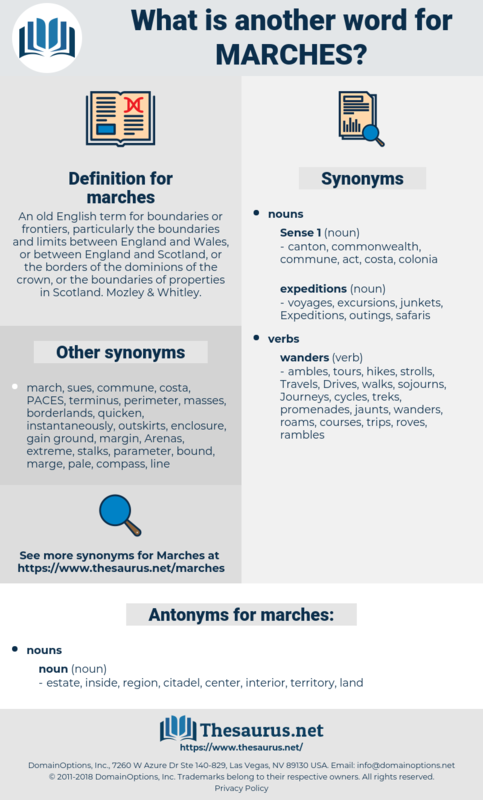 marquee, marquis, memory cache, memorise, mayoress, mirky, murky, moorish, marque, markka, marceau, marasca, merckx, morris, maroc, menorrhagia, march's, marx, morass, Mauriac, morose, mercy, marshy, marriage, mariachi, maraco, morse, margosa, moorage, man-on-a-horse, marrakesh, mars, manners, margay, minor key, mark, moraceous, myrrhis, marquise, morrigu, mergus, morceau, march, maurois, moorcock, mirage, march 2, march 25, mirish, mores, marruecos, march 19, minors, march 17, myrcia, marge, monarch, moresque, marc, memory access, marquess, marsh, marcuse, moraceae, marrow squash, Mrs., memorize, morus, marsh gas, merge, murk, marrakech, myricaceae, morocco, menarche, marsh hawk, maracay, monarchic, monarchy, manor house, maraca, myrica, mrs, morgue, minor axis, maharaja, mors, marche, maharajah, marks.